Last Monday was hot for October—a strange day, full of distractions. The radio was full of news but it all seems old. I self-medicate with baseball, flinch when my team doesn’t win. 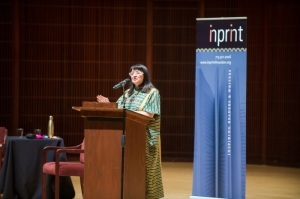 I was going to hear Sandra Cisneros read from her new nonfiction, A House of My Own: Stories of My Life. I think of her poems, the ones I taught in my multicultural literature class. My favorite was “You Bring Out the Mexican in Me.” I love that poem. Everyone had to write an imitation of this poem, but it was “You Bring Out the Blank in Me.” You had to fill in the blank to make it the right poem for you. I did it too. I think of her primarily as a fiction writer or a poet, but I think all those pieces are stories of her life, too. Maybe names have been changed—not sure. I drive early to Rice–I don’t want to be late. When I pull in to park, the sky is pink, like the West, or Mexico, or somewhere else that you might have imagined when the real sky was too dark.